One of the Miller Lite Man Laws was something like, “No fruit in the beer.” What about vegetables? A little bit Clamato, a little Bud, some shellfish and clams... yum! Hailing from the Midwest of the U.S.A., I can honestly say that this was a combination I thought I would never see on the liquor store shelf. However, I do enjoy an occasional Bloody Mary – especially as Hair of the Dog, and I have heard that beer and tomato juice is the original Bloody Mary, so why not give this a try. One of the first things that caught my attention was the color. Pink? Maybe more like the color of what I regurgitate after too many Bloody Marys. Anyway, the can says that it's “natural flavors” and “certified color.” I guess that's another way of saying “artificial”? Certified? Damn, that's creative writing. 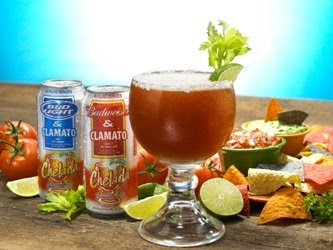 Latinos, specifically those of Mexican descent, have been mixing beer with Clamato for decades. Budweiser & Clamato Chelada and Bud Light & Clamato Chelada honor that tradition by combining Anheuser-Busch’s classic American-style lagers with the spicy, invigorating taste of Clamato Tomato Cocktail, made by Cadbury Schweppes Americas Beverages (CSAB). The name Chelada is a shortened form of the Spanish word michelada which loosely translates to ‘my cold beer.’ To order Budweiser or Bud Light & Clamato Chelada, one might say: “Una michelada con clamato, por favor.” To shorten that but still keep the beer recognizable as the traditional recipe, Anheuser-Busch focused on the name Chelada. I think this is going to be one of those “you love it or you hate it” type of things. Personally, it was a perfect opportunity to test my gag reflexes. But, don't let stop you from giving it a try.